My first baby, Howard, was born in the back seat of our family car on the way to the hospital. My husband continued driving, and I had precious minutes in the back of the car alone with my new baby. As the intense pain of childbirth ceased, I was flooded with an ecstatic love for this little, naked bundle, and the natural process of bonding began. However, I was somewhat surprised to discover that this parenting style, which felt so intuitively right to me, was out of sync with the way that much of society here in Australia expected me to parent. Although the hospital staff was very supportive of breastfeeding, they did not believe in feeding on cue. Rather, they immediately introduced me to the “Feed, Play, Sleep” mantra that continued to be pushed by the community midwives that I saw upon my discharge from hospital. The idea is that the baby is fed every three hours but not allowed to go to sleep after the feeding. (I saw one nurse instructing the mother to wake her baby with a cold cloth to the chest if she did try to go to sleep!) The baby then has a period of play time before being tightly wrapped and placed in the cot. If the baby doesn’t go to sleep, then “controlled comforting” (otherwise known as controlled crying, or crying it out) is used. When I first saw the community midwife, I was told that feeding on cue would rot the child’s teeth. I was shown graphic pictures of decaying teeth as evidence. I was also referred (as were all new mothers) to a controlled comforting workshop. We had to watch a video of a baby as it cried itself to sleep (as proof that they do in fact fall asleep eventually), but as a new mother, I found watching the video of a distressed baby quite traumatic! I was advised against sleeping with my baby, due to so-called risks associated with Sudden Infant Death Syndrome, and because it would supposedly be difficult to ever get him into his own bed. However I found sleeping with him to be such a joy, and so natural, that it was not something I would even consider giving up! I also found that I got a lot more sleep if he was able to breastfeed when he wanted to, as I continued sleeping. I remember the pictures the midwives showed me of how a baby should be sleeping to be safe – alone in a large cot without any toys, pillows, or comforters, and flat on his back – and it looked so sterile and lonely for a little being that had just emerged from the warm comfort of his mother’s belly. It seemed to me that too much emphasis was given to the child’s physical well-being at the expense of his emotional needs. Despite the advice of the midwives, I continued to feed my baby on cue, feed him to sleep, and share my bed with him, but I learned to bend the truth a little with my midwife to save myself a lecture. Apart from the midwives, I also felt pressure from family and friends to compromise my preferred parenting style. From soon after my son was born, there were invitations to attend social events without him. The intention of such invitations was undoubtedly well-meaning, to give me a break from mothering, but I did not feel comfortable leaving my baby at this stage. As I continued to decline these invitations, it was clear that many people felt I was behaving strangely. One friend even suggested that men who murder their mothers had been parented this way! I preferred to socialize with people who included their children in their social gatherings, so that I could get out without having to leave an unhappy baby. When Howard was two years old, I became pregnant with twins! As soon as this was discovered by my doctors, discussion turned to the risks associated with twin pregnancies and births. Toward the end of the pregnancy, when it became clear that the babies were both in a breech position, I was strongly advised to have a Caesarean section. I did not want to do this, as I had found that a vaginal birth was an important part of the bonding process for me and Howard. I saw a number of obstetricians who thought I should have a Caesarean section, talking of the risks (and the possibility that they would be sued if anything went wrong). Despite this advice, I still felt that I wanted to have an opportunity to deliver my babies naturally, so I contacted the Independent Midwives Association. They advised me that there was no reason I couldn’t naturally deliver twins in a breech position. They gave me the name of an obstetrician who has one of the lowest rates of Caesarean deliveries in our home state. I saw him when I was 37 weeks pregnant with the twins, and he agreed to deliver them vaginally! Thankfully, all progressed smoothly, and the twin boys were delivered five minutes apart after a short labor. Founded in 1985 and based in the United Kingdom, the Independent Midwives Association (IMA) works to support independent midwives by holding training workshops for midwives, educating the public, and lobbying for the traditional role of the midwife. The IMA can also help connect women seeking an independent midwife. For more information, go to www.independentmidwives.org.uk. 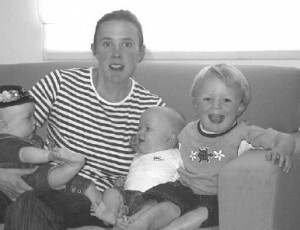 Adopting an AP style with two babies (and a toddler) proved a lot more difficult than it had been with just one infant. Feeding two on demand meant I spent most of my time on the couch, breastfeeding. Letting them sleep when it suited them meant I rarely got a break. (In fact, I did resort at times to driving them around in the car so they would sleep at the same time!) Co-sleeping with two (and sometimes three) left no room in the bed for my husband. And carrying them both in a sling proved too difficult. And yet despite the difficulties, I never wavered from my conviction that I was doing the best thing for all of us. 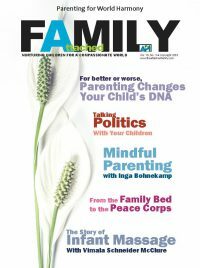 I was delighted to discover the API website, www.attachmentparenting.org, and downloaded all the articles contained there to confirm my intuitive belief that AP held numerous long-term benefits. Although I had little time for reading, I always managed to read The Journal of API when it came and was heartened to read of other peoples’ experiences. I also found support from my mothers’ group, a lovely collection of local women who had their first child at the same time as I did. None of them followed the principles of AP, and they thought me quite an oddity, but they also showed respect for what I was doing and were always there to listen when it got too hard. Also, their own horror stories of controlled crying, “sleep school,” and child care assured me that I was doing the right thing. My immediate family kept me sane with frequent visits and support, helping me in many different ways, from cooking meals, holding babies, sharing holidays with me, and spending precious time with my boys. Close family support makes AP a great deal easier! I feel fortunate to have had the education, family, and financial support to enable me to parent in the way that I felt was best. I have seen other families without these supports being influenced by medical advice or peer pressure to parent in a way that is contrary to their intuition, and that makes me sad. In my mind, AP is the most natural way to raise a happy baby. However, it requires the primary caregiver to devote these early years to the children, so that she can respond to their needs for attention, feeding, sleeping, and cuddles. Much in our society is not supportive of such a style. Often the expectation from others, whether family, peers, or the media, is that we will return to our pre-baby lives as quickly as possible. To do this, the baby needs to fit in with our adult schedules, which requires set times for feeding, sleeping, and playing. We are also expected to leave the baby with others, so we can return to work, or to socialize, or to go to the gym. It takes some strength to resist these pressures, but having done so, I feel the rewards for myself and my children have been immeasurable. I agree with everything here… except the comment that your hubby didn’t fit in the bed anymore. Why not add a twin mattress alongside your bed for added room? Push the two beds together and make one huge one. That’s what we plan to do (even though it will take up the *entire* room and leave *no* space for walking!) Dads already get the “you’re not *really* needed but we think we’ll let you hang around” message from culture. In trying to bond with our babies at the exclusion of Dad, I think we send this message again. Boo. Sometimes its hard to find ways to really keep Dad involved… especially when hubby has his own schedule that is often not flexible like we moms can be. But it’s a “must have,” don’t you think? We turned our queen sideways and built an extension at the foot of the bed out of IKEA stuff. Thank your for your story! Very touching. I support you a 100% in what you do. I have two little boys and your story warmed my heart and gave me the support I needed! Blessings to you and your beautiful family. This is great validation of my first-time mother instincts. As a matter of fact, I find that my family members – mostly the grandmothers – often suggest that I go without my infant son to be “helpful” when it’s apparent that they actually want mostly to be left alone with the baby for their own enjoyment (though I have no doubt that they are also concerned about my well-being secondarily). However, I have to say that the two-year dedication, though ideal, is a tall order for those of us who work. In the US at least, parental leave doesn’t come close to the shadow of a year, let alone two. And other factors for my son’s well-being must be considered – stable, comfortable housing; clothing and necessities; and healthy, contented parents. All these things require that he be raised in our two-income household, so I am absolutely unable to take two years off from full-time work. I envy any woman who has the privilege – yes, it’s a privilege – to stay home with their littles until they’re secure enough to be away from mommy, but I am grateful as many of my peers have less leave and income for their children. I pray that the limitations of my life in this sense do not cost my lovely little much in the long run. Thank you for the post – it is much needed support in this non-AP world.